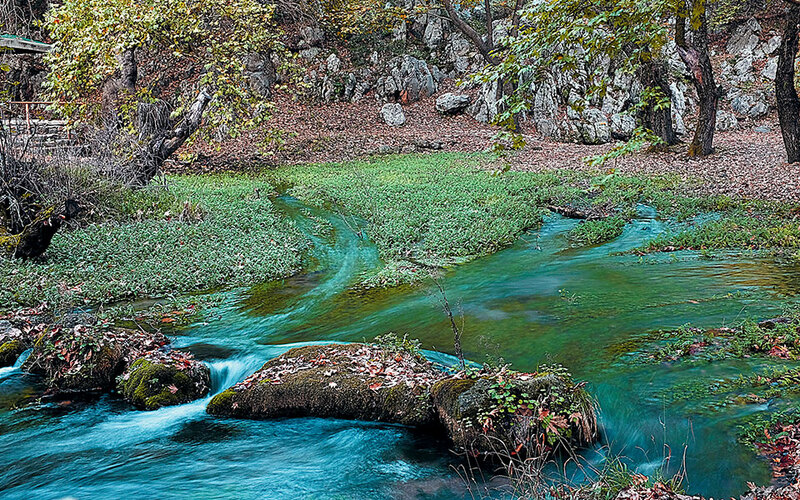 The area around the village of Kalavryta offers everything from winter sports and stargazing on Mount Helmos to exploring caves and lush river springs. The gorgeous natural landscape around the town of Kalavryta in the northern Peloponnese hides many options for the traveler: the ski resort of Mount Helmos, a charming rack railway line, superb caverns with lakes, as well as smaller caves, some of which have been turned into places of worship. 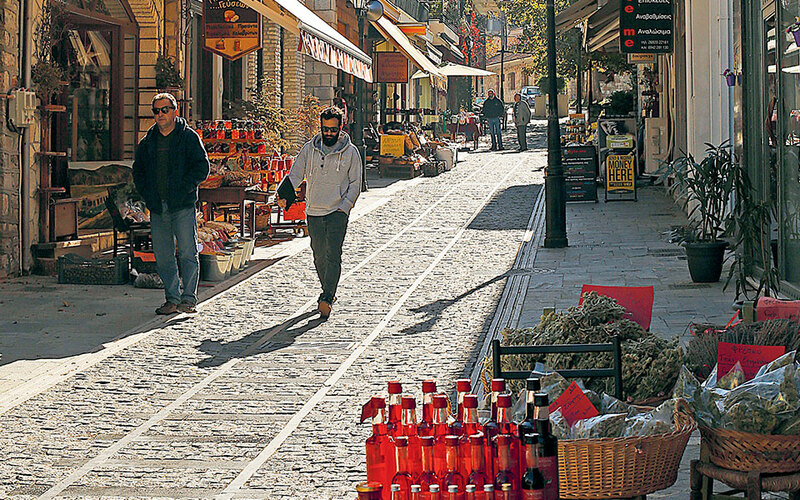 In Kalavryta itself, the liveliest area is the street of Aghiou Alexiou, the main pedestrian thoroughfare that features cafe-bars, tavernas, delicatessens, ski equipment shops and a few trees around the square which one hopes will be left in place after its planned renovation. These plane and fir trees charmingly highlight the alpine character of this small town that was essentially rebuilt from rubble after the Second World War and today is a popular (mainly wintertime) destination. The surrounding area is full of hotels. “There is a very good infrastructure of about 2,000 beds in the municipality of Kalavryta, and the majority of the hotels are either new or recently renovated,” says Konstantinos Dafalias, president of the Kalavryta Hotels Association. “The center will be upgraded with two state-of-the-art lifts with cabins and chairs, a new rope tow, grooming machines and a waste treatment facility. In addition the buildings will undergo renovation and be made more energy efficient, and automatic ticket machines will be installed. The goal, after all the works are completed, is for it to operate in the other months of the year as well with alternative activities: mountain biking, hiking routes along the Ydata Stygos springs, trekking, archery, and more. 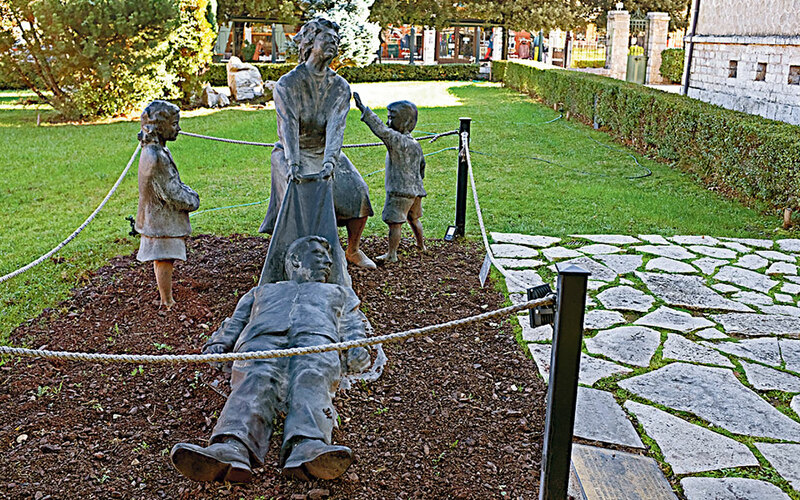 Kalavryta does not decorate itself for the holidays before the anniversary of the massacre of December 13, 1943, when the majority of the village’s male population – men and boys over the age of 13 – were killed. The slaughter was an act of retribution for the execution of 77 German officers by Greek resistance fighters of the National Liberation Front (EAM). The events of this period are richly recounted through exhibits and audiovisual materials at the Municipal Museum of the Kalavritan Holocaust. This is housed in the now historic Syngrou School, which was burnt to a shell in 1943, as indeed was the rest of the village. Today, each one of its five halls is dedicated to a different theme, beginning with black and white photographs of prewar Kalavryta. The stories from this period remain alive for many families of Kalavryta, such as Panagiotis Sarantavgas, who runs a shop selling local products on the main road, and who, like many of his neighbors, grew up in a family and area plunged into a deep state of mourning. His grandfather, Panais Sarantavgas, was one of the only 13 men to escape the massacre. 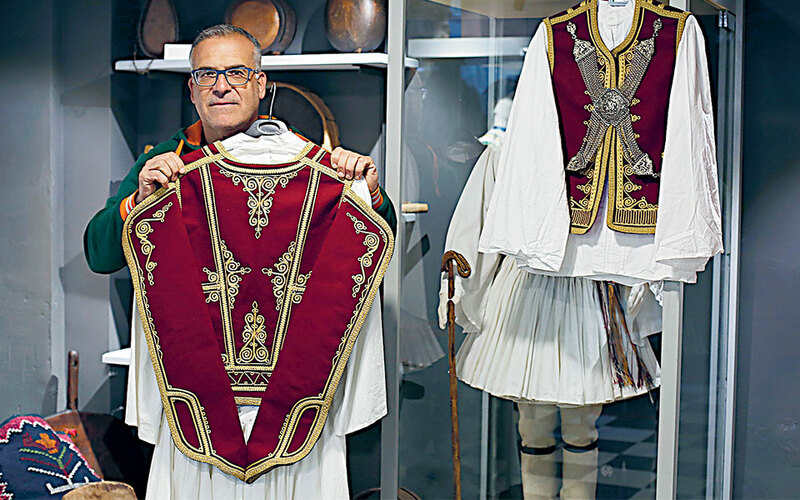 For more local history, add a visit to the small Folk and Historical Museum of Kalavryta to your itinerary, an initiative by the teacher Leonidas Petropoulos who has a particularly informative and pleasant manner as he guides you around the traditional costumes, embroideries, and decorative and household items. Municipal Museum of the Kalavritan Holocaust, tel. +30 26920-23646, Tue-Sun 09.00-16.00, 3 euros. Folk and Historical Museum of Kalavryta, tel. +30 6945-579985, daily 14.00-20.00, holidays 10.00-20.00. 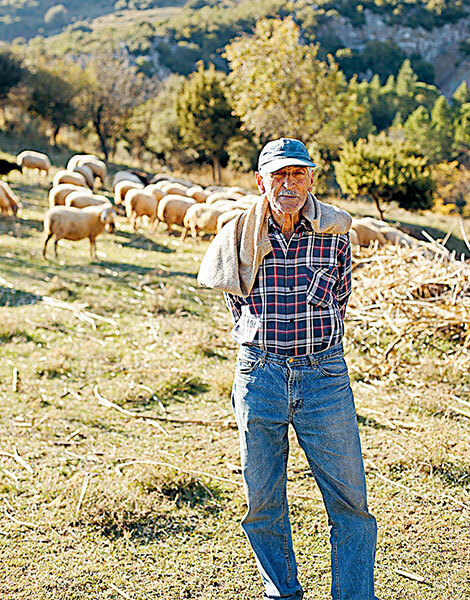 With Kalavryta as your starting point, driving from village to village will convince you that tourism has not seriously impacted the area’s tradition of livestock farming. Herds of sheep and goats will frequently block the road forcing you to stop. Visit villages such as Vlassia, Kertezi and Kleitoria, each with tavernas and grill houses around a central square, and warm fireplaces, wood burning stoves and local tsipouro (pomace brandy). Allow the mountains of Achaia to surprise you by visiting Planitero, from where the river Ladonas (or Aroanios to give it its ancient Greek name) springs. In a lush plane forest in the mountains, it is wonderful to see the crystal-clear water welling up from the ground and forming a river. Next to the springs, trout are raised in fish farms; they can be sampled in the local tavernas. There where the Ladonas river starts its journey, so too does a path running parallel to the road towards Kleitoria; this leads to the “Vine of Pausanias” a protected natural monument that is thousands of years old. Huge trunks of an ancient vine spread over trees and the outer wall of the courtyard of the church of Aghios Nikolaos in the village of Pangrati. If you wish to hike in the countryside around Kalavryta a good source for information is the local mountaineering association of Kalavryta (contact tel. +30 6946-175853). The ingredients that reign supreme here are of course meat, the renowned feta of Kalavryta and generally everything else associated with livestock farming. 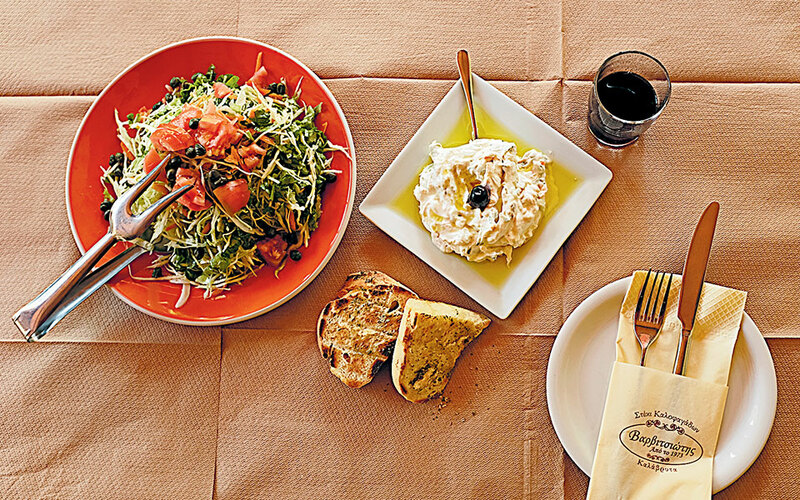 Accompany your meal with a bottle from Tetramythos Wines, ideally a Milia Red. The winery is on the main road, a little before the boundary of the municipality of Kalavryta and is open to visitors. You can pair their wines with the creative cooking of Giorgos Manikas and Maria Andriopoulou at Spiti tis Marios. They draw their inspiration from old recipes and local products. Try the trachanoto (similar to a risotto but with fermented cracked wheat in place of rice) with wild mushrooms, and other robust dishes that can stand up to a bottle of Tetramythos’ Black of Kalavryta, such as tigania (meat sautéed in wine) with lentils. You will also find bold flavors at tavernas such as Varvitsiotis in Kalavryta, with offerings such as lamb cooked in parchment paper, and high quality grilled meat cooked to order; and To Spitiko directly opposite. The taverna Sperhos outside of the village Ano Lousou stands out for its pies, good meat and friendly atmosphere. If you want to pick up some local products before leaving, stop by the butcher shop of I. G. Tziritis in the center of Kalavryta, or search for the award-winning organic honey of KΟRYS, and locally grown mountain tea and other herbs. 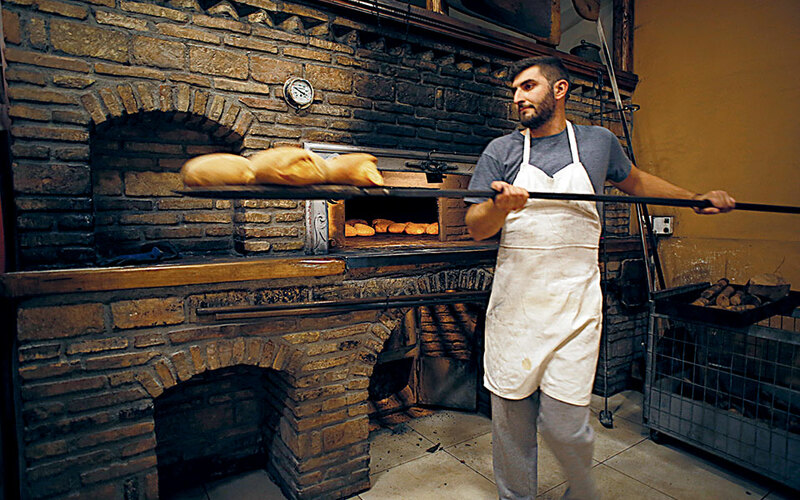 You will find fresh sourdough bread at the bakery Apostolopoulos kai Xynos, and goat’s cheese from the Dairy Farmer’s Cooperative of Kalavryta. The Odontotos, or rack railway, one of the rarer types of train across the globe, gets its name from the toothed rail (donti = tooth) that the trains use to safely move along steep stretches. Its inaugural run took place on March 10, 1896, and when it was first built it was one of the most challenging and innovative infrastructure works of its time. The journey takes one hour – unless you decide to stop for coffee or food at its only stop along the way, the village of Zachlorou. 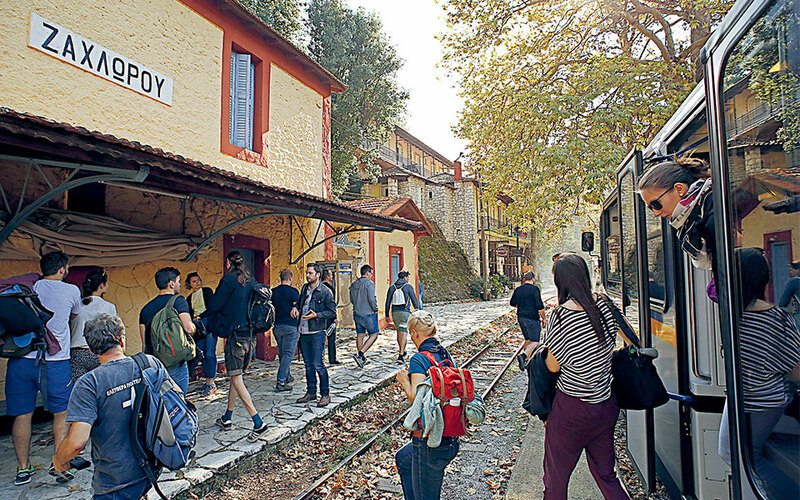 The train passes through plane tree forests, small tunnels excavated by hand and narrow gaps in the rock through which the carriages barely fit, and trundles up steep slopes at slow speeds, which enable young and old to savor the natural landscape. On most days three trains depart, and five on holidays. It is worth knowing that the gorge through which the line runs forms part of the Helmos – Vouraikos Geopark. Hikers will also enjoy the section of the E4 path that runs parallel to the tracks, which will allow them to enjoy being immersed in nature and every detail of this rich microcosm. The other exceptionally intriguing natural phenomena of the geopark are its caves, with that of Limnon, in the Kastria area, the most fascinating. Once the site of the healing sanctuary of the ancient oracle Melambodas, it continues to exude an almost mystical allure. To date almost 2 km of the cave have been explored. Of its 13 lakes that exist at different levels, the first three can be visited by the public. To reach the others, speleologists either use small boats, or more commonly swim in diving suits as the waters are ice cold. 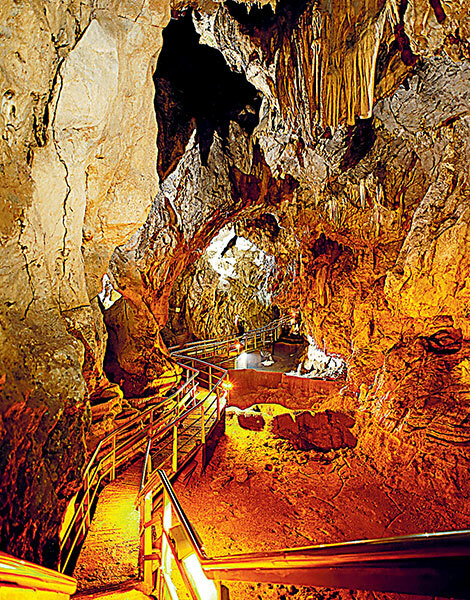 The cave also features wonderful stalactites and stalagmites, pillars and other natural wonders. You can take them all in walking along the narrow bridge that runs along the cave’s visitable part. Next to the cave, a modern learning center is being constructed which is expected to open in the spring of 2019. On the opposite slope is a church with a wave-like roof whose altar has been built into the rock, known as Spilaio tis Analipsis (Cave of the Ascension). 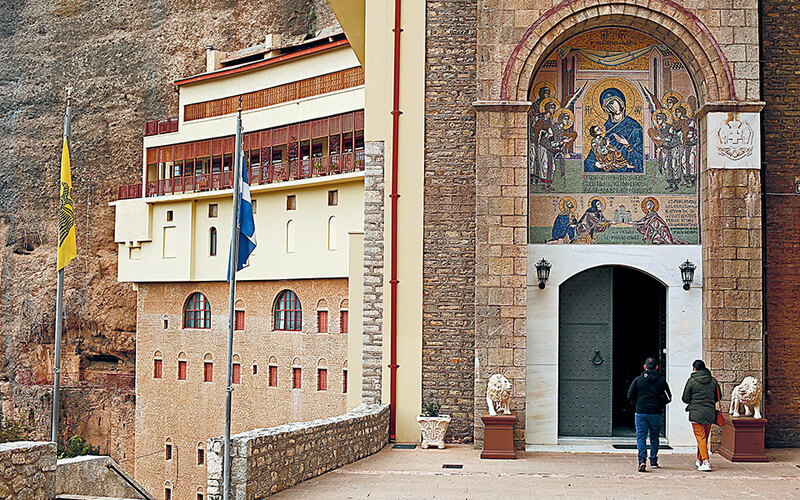 But even more impressive is a cave that was first turned into a Christian site of worship and later a monastery: Moni tou Megalou Spilaiou, which clings to a vertical rock face above the village of Zachlorou, and is one of the most popular stops in the area. Our own insatiable desire to explore drew us to Neraidorachi. That is the name of the peak on which one finds “Aristarchos” the Athens Observatory’s most sophisticated telescope, unique in the Balkans and one of the most important in Europe. 23m tall, it stands at an elevation of 2,340 meters. We arrive at the peak via 4×4 and the view in the afternoon light is magical, as are the stars that emerge a short while later. But mountain lovers and stargazers should note that driving is only feasible in the spring and the summer; hotels such as Kalavryta Canyon organize visits for small groups. 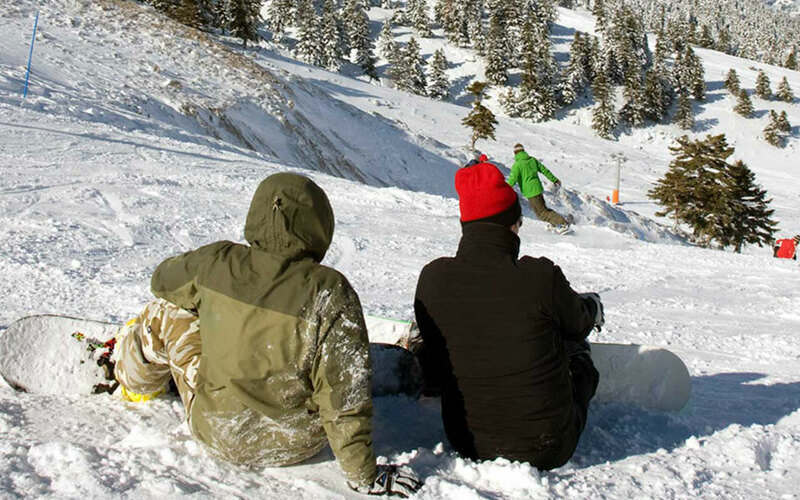 In the winter the easiest way to reach the telescope is via the ski lifts of the ski center (you can find out more information at helmos.astro.noa.gr). 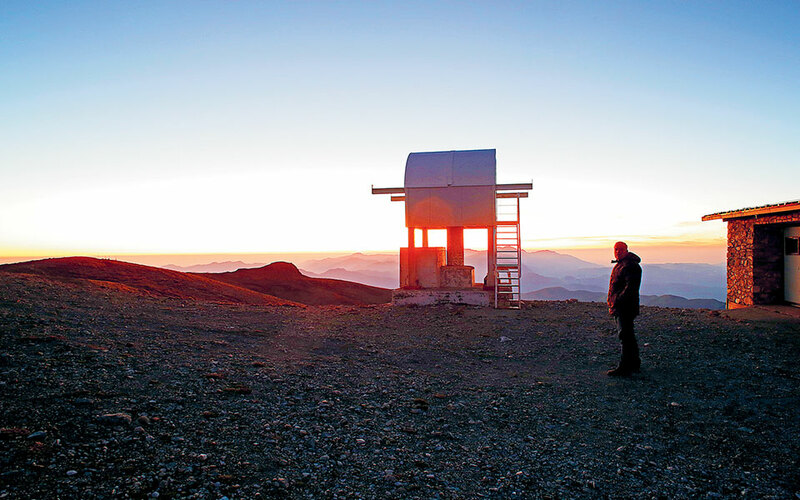 The overhaul of the ski center will make reaching the telescope easier, something that will also help the astronomers themselves in their work, according to the head researcher of the Helmos Observatory, Panagiotis Hantzios. In certain cases, small groups of up to 10 people can be given tours of its interior. To discuss obtaining permits, contact the Helmos Observatory (tel. +30 210-8109161). Filoxenia Hotel and Spa, tel. +30 26920-22422. A recently renovated hotel that offers very good value for money, and spa services with a sauna and hammam. From 50 euros on weekdays including breakfast. Azanias Chalet Kalavryta, tel. +30 26920-29100. Elegant studios and apartments with modern architecture and a nice sense of independence on the 1st km along the road heading to the ski resort, with a view of Kalavryta. From 90 euros with breakfast. Anerada, tel. +30 26920-24777. A hotel at the location of Paliopigado, 1.5 km from the center of Kalavryta with its own parking lot on the 1/2 hectare grounds that surround it. From 70 euros for a double with breakfast. Kalavryta Canyon Hotel & Spa, tel. +30 26920-22004. Spacious areas from the reception and the restaurant to the rooms, with a sense of luxury and decorative details that add a festive feel. Features a spa and conference center with a capacity of 350 people. From 75 euros for a double with breakfast. In Kalavryta you will also find many other worthwhile hotels, as well as guest houses such as Chrysa, tel. +30 26920-22443, from 55 euros.